NEW YORK, Oct. 3, 2017 /PRNewswire/ -- Fresh off a summer tour in Europe, Mario Frangoulis announces an intimate North American tour in New York, Montréal, and Los Angeles, from November 6-11, 2017. Mario Frangoulis, the classical crossover tenor and powerhouse vocalist has sold over 1 million records worldwide and will present a varied repertoire of music highlighting his exceptional range and expression during his concert series, "An Evening with Mario Frangoulis." 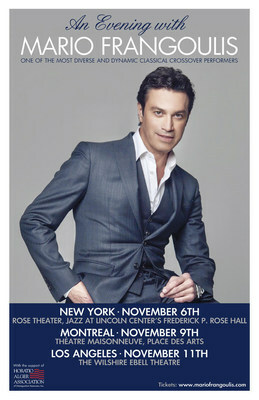 See Mario Frangoulis Live in Concert in New York, NY November 6th, 2017 at the Rose Theatre in Lincoln Park and in Los Angeles at the Wilshire Ebell Theatre on November 11th, 2017. 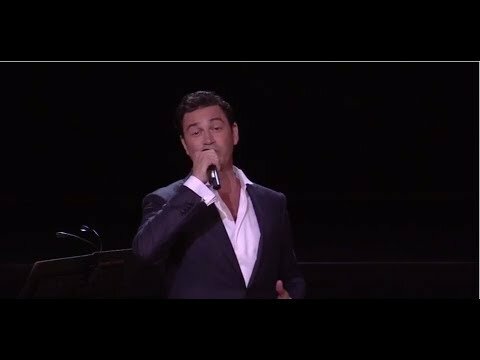 Broadway World raves: Frangoulis is "one of the most beautiful tenor voices on earth" and although he is known for his charm, good looks and humanitarian spirit, it's Mario's unique voice with "glistening dynamics and tonal control" (CNN), that has captured audiences across the globe. Critics agree: Mario is unique and versatile… "[He] is a veteran stage performer well-versed in everything from classical opera to popular musical theater, even Shakespeare... an extraordinary artist" (AllMusic). Mario catapulted to fame after being discovered by legendary producer, Sir Cameron Mackintosh, who cast him as Marius in Les Misérables in London's West End upon graduation from the prestigious Guildhall School of Music and Drama in London. After receiving rave reviews in Les Mis, Mario played Raoul in Phantom of the Opera. His instant success in the world of musical theatre was only a prelude to a multi-faceted career that put him at #2 and #3 on Billboard's Classical Crossover charts with his first two international albums, "Sometimes I Dream" and "Follow Your Heart," at #10 on BMG's International Charts with "Passione," and at #12 on Billboard's Classical Music Charts with the debut of his first holiday album, "Tales of Christmas" in 2015. Awarded both the prestigious Maria Callas Prize and Pavarotti Competition for his classical achievements and voted "Best Male Classical Crossover Artist in 2011," Mario has toured extensively, filmed several live concerts, and released 19 personal albums. He has performed with a wide range of incredible artists in all musical genres from Placido Domingo, Sarah Brightman, and Lara Fabian, and to Jose Carreras, Smokey Robinson, and Justin Hayward of the Moody Blues. Mario has exemplified excellence in all his musical pursuits, and has become known throughout the world for blending classical and contemporary sounds with perfection and authenticity. An Evening with Mario Frangoulis will include songs from his international repertoire ranging from Vinceró, Perderó and Notte di Luce (Nights in White Satin) originally recorded with Justin Hayward to Beautiful Things by Stephan Moccio and a fresh interpretation of the jazz classic Nature Boy arranged by Grammy winner, Jorge Calandrelli. Diverse and enchanting, An Evening with Mario Frangoulis will transport listeners on a musical journey that fuses classical and contemporary sound inspiring all ages. Fans of Andrea Bocelli and Josh Groban will fall for this passionate performer. Following his Los Angeles concert, Mario will join Sarah Brightman on her Royal Christmas Gala series across Europe. To learn more about Mario Frangoulis, visit: https://www.mariofrangoulis.com/press and his website, Facebook, or Instagram. Presented by BeautifulThings Productions, Attila Glatz Concert Productions, and support of the Horatio Alger Association. For more about the Horatio Alger Foundation, visit: https://www.horatioalger.org.